FIGURE 6 (A) A neuron from the cerebral cortex of a 605-day-old male Long-Evans rat (50). 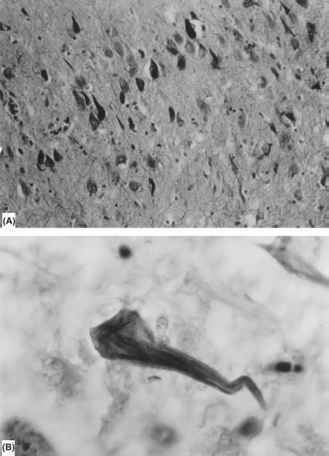 There are numerous dense bodies (lipofuscin) irregularly distributed in the perikaryon (original magnification x1440); (B) a portion of a neuron from the cerebral cortex of the same 605-day-aged animal (50). The lipofuscin granules are clustered at one pole of the nucleus (original magnification x6000). Source: Gerontological Society of America. (Fig. 8A and 8B). 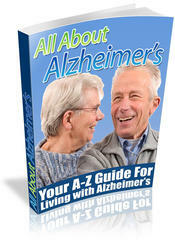 The tangles are present in the normal aging brain, frequently in the hippocampus, and their accumulation in the cortex and other brain areas is one of the diagnostic signs of senile dementia in AD (Chapter 7). In AD, tangles would be in greatest number in the associative areas of the cortex, and their distribution may reflect a primary toxin/infection spread through the olfactory system (54,55). The density of the tangles has also been correlated with the dementia severity, cell loss, and cholinergic deficits (56,57). 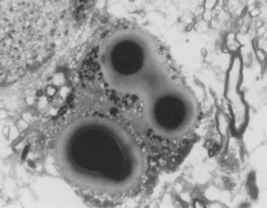 FIGURE 7 Lewy bodies, intraneuronal cytoplasmic inclusions. The dense core is composed of apparently random, tightly packed aggregations of filaments, vesicular profiles, and poorly resolved granular material containing neurofilament antigens. These bodies are found in substantia nigra as well as in other CNS regions. Abbreviation. CNS, central nervous system. Source. Courtesy of Dr. L. S. Forno. insoluble and are composed predominantly of the microtubule-associated protein (MAP) tau. They react with monoclonal antibodies specific for neurofilament proteins or for MAPs (58). Because neurofilaments and microtubules are normal constituents of the cytoskeleton, the immunologic reactivity of PHF supports the hypothesis that several cytoskeletal proteins are linked in the formation of these abnormal, helical filaments (59). Alterations of tau protein (i.e., a microtubular protein that enhances the polymerization of tubulin subunits) and of the enzyme protein kinase that catalyzes its phosphorylation are involved in the PHF generation. Tau proteins have attracted special attention because of their crucial role in regulating balance between stability and plasticity of the neuronal cytoskeleton (60). Tau proteins have several isoforms that result from alternative splicing during transcription from a gene located on chromosome 17. Tau undergoes phosphorylation at several sites along its length. Excessively phosphorylated tau leads to aggregation of tau molecules into PHFs and subsequently into insoluble NFTs. Although the cause of hyper-phosphorylation is not known, a likely mechanism in AD may be the induction by elevated levels of amyloid-b-42 peptide (60-65). More discussion on the possible central role of tau protein in the pathogenesis of AD is presented in the next chapter (Chapter 7). FIGURE 8 Neurofibrillary tangles in hippocampus pyramidal layer. (A) Neurofibrillary tangles (low magnification) accumulate in neuronal bodies and stain very darkly; (B) a neurofibrillary tangle (high power) shows the characteristic flame shape. Source: Courtesy of Dr. L. S. Forno. 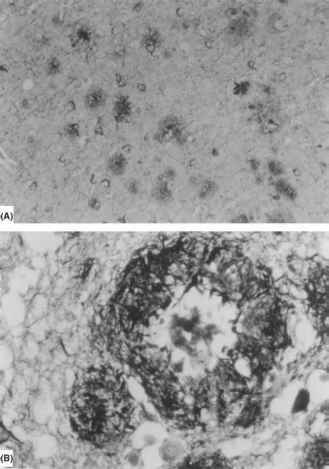 FIGURE 9 Neuritic plaques in frontal cortex, silent area: (A) presence of neuritic plaques (large) and neurofibrillary tangles (small) (low power); (B) neuritic plaques (high power). Source: Courtesy of Dr. L. S. Forno. Glial, especially microglial, cells react to the NP and accumulate about the abnormal nerve cell processes (Fig. 10). One theory is that development of the plaque proceeds first from abnormalities of the neural processes, is then followed by deposition of amyloid, and, later, by stimulation of reactive microglial proliferation. Another view proposes that the primary formation of the plaque depends on the leakage of amyloid from the capillaries or of a precursor substance of blood origin that diffuses into the cerebral tissue. This amyloid deposit would accumulate extracellularly, leading to the destruction of neurons and simultaneous proliferation of microglial cells (Chapter 7). 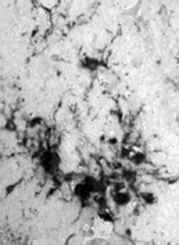 FIGURE 10 Microglia cells surrounding a neuritic plaque. The neuritic plaque is usually surrounded by microglial cells trying to surround the neuritic plaque and limit the possible damage to the interstitial tissue. The increased number of microglia generate an inflammatory reaction around the neuritic plaque. The use of anti-inflammatory drugs in Alzheimer's disease treatment is based on reducing the inflammatory involvement in the neuritic plaque. Source: Courtesy of PC. McGeer. oxidative damage and glycosylation of proteins result from the decreased rate of protein turnover. Amyloid deposits are not confined to the brain but may occur in several tissues and organs, where their presence is noted in a number of conditions classified under the general term "amyloidoses," which represent a number of diseases characterized by extracellular accumulation of insoluble fibrillar proteins. 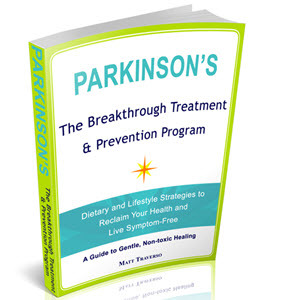 These diseases show pronounced age dependence, and their prevalence increases rapidly toward the end of the life span. Inasmuch as amyloid is present in some of the neuro-degenerative diseases prevalent in old age, considerable attention is being given to understanding the structure of the deposits in the brain and to finding therapies to prevent their formation or to induce their dissolution. ■ Primary systemic amyloidosis: As in myeloma, amyloid is produced by proteolytic cleavage of the N-terminal variable region of the immunoglobulin (Ig) light chain in phagocytic cells. ■ Secondary amyloidoses: These occur in chronic inflammation with accumulation of amyloid A protein. ■ Familial amyloidoses: Prealbumin is the major accumulating protein. Senile cardiac amyloidosis is present in 65% of hearts from persons 90 years of age and older. Cardiac focal deposits of amyloid have few functional consequences, but extensive distribution is associated with congestive heart failure and fibrillation (Chapter 20). Other forms are found in senile lungs, liver, kidneys, and, in general, in senescent or injured tissues. Controversy still exists regarding the origin, deposition, and toxicity of amyloid (Chapter 7).